I've now finished my little investigation into the Pwyll story in many versions, and I do like the way Russell Celyn Jones decided to tackle the story. He transposed it into the a not-too-distant world - one close to one of the central worlds of David Mitchell's Cloud Atlas or Russell Hoban's Riddley Walker. But instead of somewhere English this was a futuristic south Wales - a post-industrial blend of decay and encroaching wilderness. 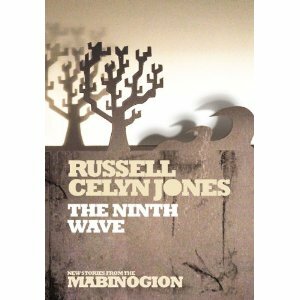 In the Ninth Wave I recognised the streets and scenery of Swansea, and I think, Pembrokeshire. According to the 'landscapes' book I have, these areas of south-west Wales Dyfed, Narberth and the Gower are real Mabinogion territory. In this world cars are again a novelty and people have reverted once more to horses. Odd bits of a more advanced past survive - like goretex overcoats - but in most places the factories have been turned over to recycling or left empty. It is a world ideal for this branch of the Mabinogion. The prince is inspired by the soldiering of the present Prince Harry, and the disappearance of the prince's son is engineered by itinerants rather than a monster. Rhiannon is sassy in a way that is at once both modern and medieval, and I particularly like the way Russell Celyn Jones transposed her punishment (inflicted because she was falsely blamed for losing her son). This was a beautiful and really affecting depiction of a psychological struggle. The worst aspect of Rhiannon's punishment - whether carrying people on her back in the old version, or cleaning out other people's toilets in this one - did not lie in her public humiliation but in the loss of her child. The scene where they are reunited is a study in reaction and interaction and rings bleakly true. Close to the end there is a brilliantly described section on surfing - using the challenge of riding the waves to explore the relationship between father and son, and the child's increasing dominance over the father. It was quite a surprise to come across this. I had expected a retelling of the Mabinogion to stick to something lyrical but I think this is better. Reading the story in the different versions really helped me to appreciate the story more and allowed me to realise its timelessness. Sunday Salon: Skippy Dies by Paul Murray.